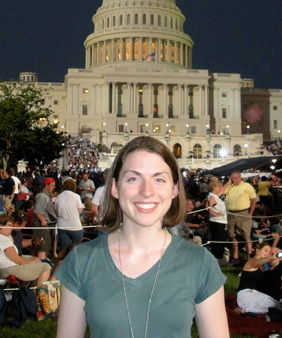 Rosemary Metcalf on the lawn of the U.S. Capitol for the dress rehearsal of the National Symphony Orchestra’s 2010 Fourth of July concert. How long have you worked at Juilliard, and what do you remember about your first day? I’ve been at Juilliard since the beginning of the 2009-10 school year. On my first day, the first person I met was George Stelluto (in the elevator). Ben Sosland [administrative director of historical performance] and I attended the opening orientation meeting in Paul Hall. After that, I went to the prop shop in search of some artwork, because the Historical Performance Office was new and empty. What job at Juilliard would you like to try out for a day and why? I would love to spend a day in Christopher Mossey’s job, associate vice president for artistic and strategic initiatives. From my perspective, he always seems to be meeting with influential people or traveling around the world; it would be fun to see how different ideas or opportunities grow into large-scale Juilliard projects. A close second choice would be a work-study job in the Ensemble Library. Did you know that they use electric erasers? What is the strangest or most memorable job you’ve ever had and what made it so? My most memorable job to date was “instrument zookeeper” for an orchestra education program. I presented instrument petting zoos in elementary schools. Besides learning about kids and school music programs, I learned how to operate a freight elevator, how to make an instrument sanitizing spray, and most importantly, how to fit about 30 orchestral instruments into a small sedan. Depending on the weather and the time of year, I might head down to the Union Square farmer’s market or holiday market. I would spend an hour or two people-watching, snacking, and browsing. I would probably investigate a coffee shop on The New York Times’s “New York’s Best Coffee” list. Then, I would pick up some new books at the library and spend the rest of the day relaxing. Many Juilliard staff members are also artists. If that applies to you, how do you balance your job and your artistic endeavors? If it doesn’t apply, did you ever consider pursuing an art, and why didn’t you? I studied flute all the way through college, but I had very little desire to become a full-time professional performer. I find informal performance opportunities through the New York Alumnae Chapter of Sigma Alpha Iota, a women’s music fraternity in which I am active. For now, I’m satisfied to help organize performances or enjoy them as an audience member. I am an avid home cook—I love trying new recipes and getting to know unfamiliar ingredients. I’ve gotten really good at making falafel. Most of all, I enjoy eating (and sometimes sharing) my creations. Having always lived in the Northeast, my immediate travel goal is to visit the Western part of the United States. I would love to go to the Grand Canyon, Zion, and Yellowstone National Parks to experience some of our country’s natural beauty. I’m currently reading American Muse: The Life and Times of William Schuman by Joseph W. Polisi, which, as one might guess, is a biography of the composer and former president of Juilliard and Lincoln Center. Although I don’t know Schuman’s music very well, I am enjoying learning about the history of Juilliard and Lincoln Center. I have an identical twin sister, Julie, who plays violin and viola and lives in the Boston area. One of my favorite things about New York City is the fact that it is a hub for so many different professional fields, especially the arts. There are so many opportunities available and connections to make. I haven’t been bored since I moved here.